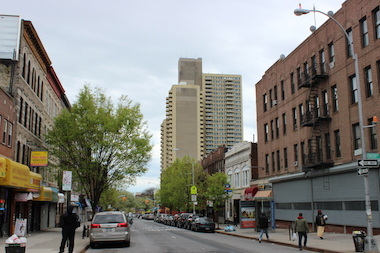 Tivoli Towers, built in 1979, is one of the tallest buildings in its immediate neighborhood in southwest Crown Heights. CROWN HEIGHTS — Federally-subsidized tenants at a Crown Heights high rise are fighting a plan to force them to move into smaller units, enlisting help from elected officials who are trying to convince the city to let them stay where they are. The letters, which have also been sent to tenants in similar situations across the city, sparked outrage from residents as well as elected officials who began attempting to intervene with HPD on their behalf. Mitchell has been helping her neighbors appeal the letters over the last few months. For the many seniors living in the building, that means getting testimony from a physician saying they are too frail or ill to move. According to HPD, 316 of these medically-necessary appeals have been approved so far this year. Among the tenants who she's been helping is an 87-year-old woman who's inhabited a two-bedroom apartment for 40 years — and is fighting an HPD order to move to a one-bedroom. Tivoli Towers has been locked in a battle over keeping housing rates affordable for years, after the state-subsidized Mitchell-Lama facility was purchased by a developer looking to convert it to market-rate units, according to reports. As a result of the building's sale and conversion to market rates in 2010, tenants were granted an enhanced Section 8 voucher to cover the increased rental costs. Tenants who are not successful in their appeal to HPD and who refuse to move have been told they will lose the enhanced portion of their Section 8 benefits and the accompanying additional rental funds that go with it, and will receive standard Section 8 benefits, advocates said. HPD officials blame the need for the change on $35 million in deficits they said were sparked by the federal budget sequester. Though some of those funds have been restored, a spokesman for HPD said it is not enough to reach pre-sequester levels. He said the agency made a decision to deal with the funding cuts that allowed all those who have a voucher for housing to keep it, as opposed to cutting vouchers completely. Rita Popper, president of the Knickerbocker Plaza Tenants’ Association and co-founder of the Housing Alliance Against Downsizing — a coalition created to fight the HPD’s new policy — said the agency's stance is unacceptable. “The question is, does HPD have the right to use people as if they’re chess pieces?” Popper asked, adding that the department “has not thought [of] the problems and costs associated with moving,” especially for the elderly. The letter said many residents, elderly or otherwise, are not in a position to "compile all the necessary papers to file their appeals," and that if they're forced to relocate, to pack up a life’s worth of possessions in such short windows of time without any assistance or clear guidance from HPD, is not only wrong but also callous. “The downsizing of Tivoli Towers is an unfortunate situation that I am vehemently against," Cumbo wrote, "particularly for the seniors whom I feel should not be displaced from the only homes they have known for the past several decades."